This contention – this bogus meme – is simply false. The relevant report makes no such claim. I’m going to show you how the original statements in the report – which made points about the statistical distribution of expected broadband speed demands in 2023 – have been morphed by a process of mis-quoting and mis-understanding into a false (and misleading) statement that simply is not in the report at all. The resulting statement now has a life of its own, and when anyone argues with it (e.g. on Twitter), people respond by linking to media articles that simply parrot the same falsehood as ‘proof’ (rather than reading the original source material). This ironic outcome (claiming something is true, just because you can link to a copy of the statement somewhere else on the Internet) is so common that it, too, has scored a great xkcd cartoon. That cartoon is appropriately called Cytogenesis. This sentence looks appealingly similar to the bogus meme, doesn’t it. It actually says something completely different. The key here is the use of one little word in that sentence – ‘median’. Please take a look at the definition of median – it is really important in this context. From what ‘median’ actually means, the statement above in fact makes it clear that by 2023, the projection made in the report is that half of Australian households will consider 15 Mbps line speeds to be too slow for their needs. 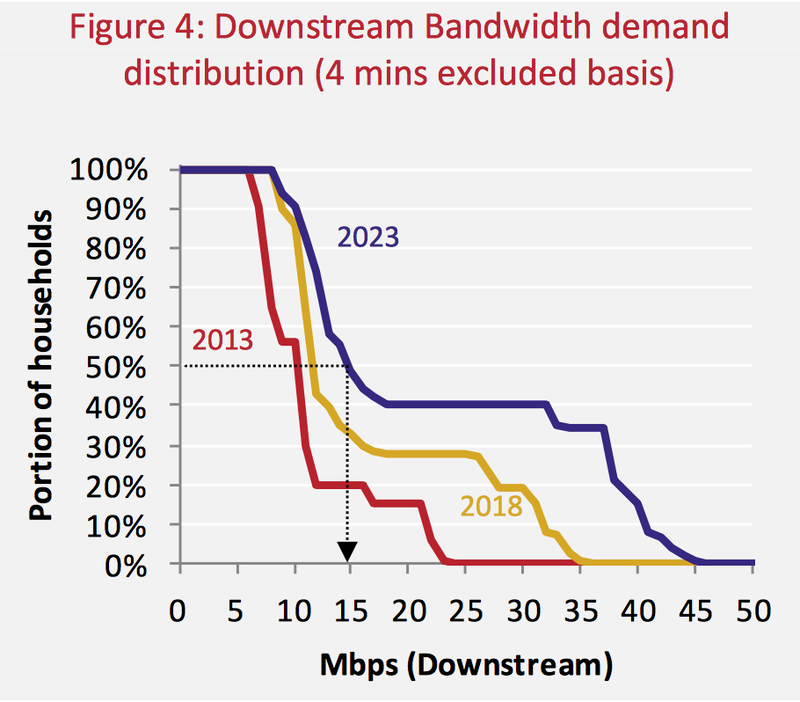 The report goes on to project that (based on its underlying modelling assumptions) the NBN would require line speeds of at least 43 Megabits per second in order for it to be likely that the NBN would satisfy the needs of at least 95% of the population. Even at that point, by implication, the remaining 5% of the household population will still consider 43 Megabits per second to be insufficient for their requirements at that time. Note that in offering figures for median demand, we are not suggesting that access network capacity should be based on this metric – by definition, such a network would (to some extent) disappoint 50% of households. Rather, access capacity should be driven by higher end users. Whether this means the top 1% or the top 5% (or some other figure) is a matter of judgement. How did a relatively non-contentious statistical analysis and a fairly innocuous statement about the median demand speed being 15 Mbps, turn into the bogus meme that I lead with? Well, like many good falsehoods, this metamorphosis has happened in multiple steps. Immediately the report was released, journalists started asking people about the report’s 15 Megabit figure, writing about it, and asking others for comment about it. In their eagerness to jump on this surprising figure (only surprising because they apparently didn’t understand what it meant), they created the first mutation of the content of the report. They did this by dropping that confusing word ‘median’ (which they likely didn’t understand), and by substituting another word that they did understand (‘average’), presuamably on the (incorrect) basis that they’re near-enough to meaning the same thing. There are two things worth underscoring at this point. The statistical terms ‘average’ and ‘median’ are very different things and they are used to communicate quite different concepts about a sample space. If you don’t understand a word in something you’re planning to quote, changing that word into some other word that you do understand is likely to result in a different statement – one that is either false, misleading, or both. Changing the word ‘median’ to ‘average’ critically mis-quotes the source material and changes its meaning entirely in this case. In their cost-benefit analysis of the national broadband network, the Vertigan panel predicts that in 2023, an average Australian household will require a broadband download speed of 15 megabits per second (Mbps). Bill Morrow, the CEO of NBN Co said he is “curious” about this prediction. I would go further and say it is simply wrong, and calls into question the validity of the conclusions of the Vertigan cost-benefit analysis. No wonder that Bill Morrow was reported (as above) as being ‘curious’ about this prediction – the prediction he was asked about was never made in the report in the first place. Amazingly, this 15 Mbps prediction for 2023 is less than Ookla’s reported actual average download speed in Australia, today, in September 2014 (16 Mbps). This statement is also wrong – specifically the underlying comparison is wrong. That is because we’re comparing a false premise about the future speeds (whose source statement was never about average download speeds in the first place) to an observed average download speed in the Internet in Australia today. We are now half way to the bogus meme. To complete the journey to full bogosity, we just need the media to further modify that misquoted version of the original by dropping the use of the word ‘Average’ entirely, and (instead) to start talking about ‘typical households’ and their requirements. By 2023 the typical household will need just 15 megabits per second, according to the review’s bottom-up analysis. With the above, we have now completed the journey to the bogus meme. Losing the word ‘average’ (not just the word ‘median’) has wrecked any remain semblance of accuracy with respect to what the original report said. We started this journey from a theoretical statistical analysis and modelling exercise indicating that that by 2023, half the population will need to be accessing speeds above 15 Mbps in order to be satisfied with their Internet experience. Through multiple steps of butchering the original statements made in the report, we have morphed this original contention into the bogus meme, contending that the government has funded a report claiming 15 Mbps download speeds to be sufficient as an NBN download speeds in 2023. Now that you have you’ve got this far, I’d ask you to read the whole relevant piece of the report (around that ’15 megabit’ figure) in context – to put all of this together, and to appreciate that the source material was in fact framed pretty rationally. The important thing is to do what the many in the media have clearly failed to do – which is to read it slowly and carefully. If you do that, you will hopefully appreciate that the aim of the exercise was to illustrate the statistical spread of demand levels within the population, rather than to conflate median (or even average) speeds with the peak speeds the network requires in order to keep most people happy in 2023. On this ‘4 minutes excluded monthly’ basis, bandwidth demand grows as shown in Figure 4. As of 2023, the median household requires bandwidth of 15 Mbps (the arrow on the chart), while the top 5% have demand of 43 Mbps or more. Bogus memes are a lot like cockroaches – there’s always one more. I don’t expect this one to be magically extinguished by the mere presence of this blog post. However, I do hope that some people might read this, and might choose to understand (and perhaps even to agree with) where I’m coming from. This entry was posted in broadband and tagged bogus, broadband, meme, nbn, nbnco by simonhackett. Bookmark the permalink.